RE/MAX Escarpment Realty Inc., Brokerage is committed to respecting your privacy and has prepared this Policy to inform you of our policy and practices concerning the collection, use and disclosure of Personal Information. This Policy governs Personal Information collected from and about individuals who are or may become Clients of RE/MAX Escarpment Realty Inc., Brokerage and individuals or organizations with whom RE/MAX Escarpment Realty Inc., Brokerage works with. Using contractual or other arrangements, RE/MAX Escarpment Realty Inc., Brokerage shall ensure that agents, contractors or third party service providers, who may receive Personal Information in the course of providing services to RE/MAX Escarpment Realty Inc., Brokerage as part of our delivery of real estate services, protect that Personal Information in a manner consistent with the principles articulated in this Policy. This Policy does not cover aggregated data from which the identity of an individual cannot be determined. RE/MAX Escarpment Realty Inc., Brokerage retains the right to use aggregated data in any way that it determines appropriate. RE/MAX Escarpment Realty Inc., Brokerage, Brokers or sales representatives may use personal information for commission management purposes (e.g. commission financing, commission dispute resolution). RE/MAX Escarpment Realty Inc., Brokerage's use of Personal Information is limited to these purposes. RE/MAX Escarpment Realty Inc., Brokerage does not sell, trade, barter or exchange for consideration any Personal Information it has obtained. Unless permitted by law, no personal information is collected about an individual without first obtaining the consent of the individual to the collection, use and dissemination of that information. RE/MAX Escarpment Realty Inc., Brokerage does not knowingly collect Personal Information from anyone under the age of 18, especially children under 13, and does not use such information if RE/MAX Escarpment Realty Inc., Brokerage discovers that it is has been provided by a minor. RE/MAX Escarpment Realty Inc., Brokerage may disclose Personal Information of Clients to organizations that perform services on its behalf. This will only be done if such organizations agree to use such information solely for the purposes of providing services to RE/MAX Escarpment Realty Inc., Brokerage and, with respect to that information, to act in a manner consistent with this Policy. Please note that there are circumstances where the use and/or disclosure of Personal Information may be justified or permitted or where RE/MAX Escarpment Realty Inc., Brokerage is obliged to disclose information without consent. Where obliged or permitted to disclose information without consent, RE/MAX Escarpment Realty Inc., Brokerage will not disclose more information than is required. RE/MAX Escarpment Realty Inc., Brokerage endeavours to ensure that any Personal Information provided by Clients and in its possession is as accurate, current and complete as necessary for the purposes for which RE/MAX Escarpment Realty Inc., Brokerage uses that data. Information contained in files that have been closed is not actively updated or maintained. RE/MAX Escarpment Realty Inc., Brokerage retains Personal Information as long as RE/MAX Escarpment Realty Inc., Brokerage believes it is necessary to fulfil the purpose for which it was collected and Firm legal or business requirements. RE/MAX Escarpment Realty Inc., Brokerage endeavours to maintain adequate physical, procedural and technical security with respect to its offices and information storage facilities so as to prevent any loss, misuse, unauthorized access, disclosure, or modification of Personal Information. RE/MAX Escarpment Realty Inc., Brokerage further protects Personal Information by restricting access to it to those Employees and Contractors that the management of RE/MAX Escarpment Realty Inc., Brokerage has determined need to know that information in order that RE/MAX Escarpment Realty Inc., Brokerage may provide services to Clients. RE/MAX Escarpment Realty Inc., Brokerage permits access to and review of Personal Information held by RE/MAX Escarpment Realty Inc., Brokerage about an individual by the individual concerned. If an individual believes any Personal Information concerning that individual is not correct, that person may request an amendment of that information by sending a request to the person indicated in Section 1 of this Policy. RE/MAX Escarpment Realty Inc., Brokerage reserves the right not to change any Personal Information but will append any alternative text the individual concerned believes appropriate. Where not required to be retained by the Firm, an individual may also request that RE/MAX Escarpment Realty Inc., Brokerage delete an individual's Personal Information from RE/MAX Escarpment Realty Inc., Brokerage's system and records. However, due to constraints of computer technology and the fact that RE/MAX Escarpment Realty Inc., Brokerage backs up its systems, Personal Information may continue to reside in RE/MAX Escarpment Realty Inc., Brokerage's systems after deletion. Individuals, therefore, should not expect that their Personal Information would be completely removed from RE/MAX Escarpment Realty Inc., Brokerage systems in response to an accepted request for deletion. Where information will be disclosed, RE/MAX Escarpment Realty Inc., Brokerage will endeavour to provide the information in question within a reasonable time and no later than 30 days following the request. RE/MAX Escarpment Realty Inc., Brokerage will not respond to repetitious or vexatious requests for access. In determining whether a request is repetitious or vexatious, it will consider such factors as the frequency with which information is amended, the purpose for which the information is used, and the nature of the information. To guard against fraudulent requests for access, RE/MAX Escarpment Realty Inc., Brokerage will require sufficient information to allow it to confirm the identity of the person making the request before granting access or making corrections. This statement is in effect as of January 1st, 2004. RE/MAX Escarpment Realty Inc., Brokerage will from time to time review and revise its privacy practices and the Policy. In the event of any amendment, an appropriate notice will be communicated to Clients and others in an appropriate manner. 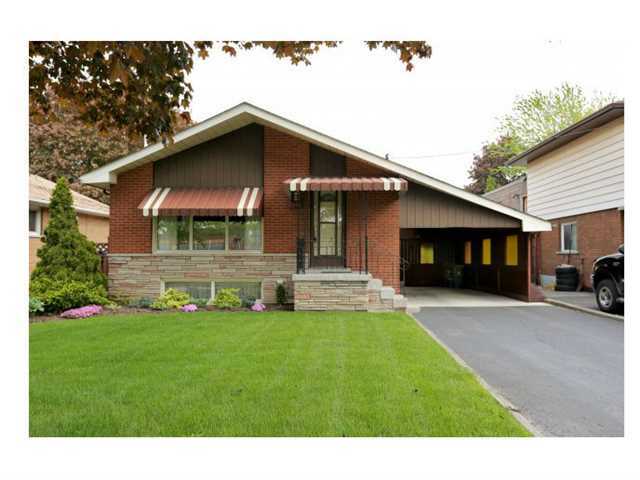 Lovely 3 bedroom Hamilton Mountain home offered at $419,900.